Ever Thought Of India As An Ultimate Surf Destination? India is the largest peninsula in the world with 7000 km long coastline, surrounded by the Arabian Sea on the west, Bay of Bengal on the east and Indian Ocean to its south. With water bodies all the three sides there is no doubt that India can turn out to be the ultimate surf destination. Surfing in a way just connects you with the raging waves of the ocean and just helps you handle the uncertainty of life. 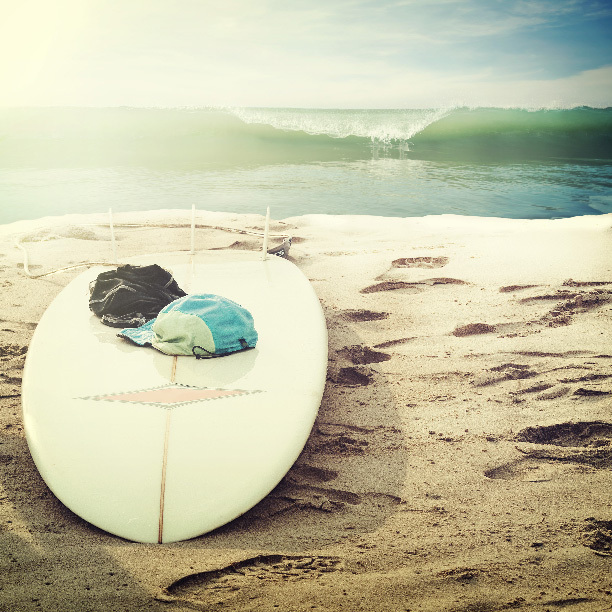 Ever wondered about the origin of the word ‘surf’? You will be surprised to know that the word ‘surf’ originated from India itself. It was derived from an Indian word ‘suffe’ which is originally used in reference to the coast of India. So, surfing has another great connection with our country other than the ideal coastal conditions. More and more people are now attracted to this sport and are trying their best to make this sport reach new heights. India is now developing a lot on the tourism front and it has much more to talk about than the usual religious stories. It has much to offer on the adventure tourism- Rafting, bungee jumping, hot air balloon ride, and trekking to different places is a new trend in India. People are totally in love with these activities and ready to explore as much as they can. Also, the good part is the trend of backpacking is also picking up speed and we have more of travelers as compared to tourists. Similarly, the surfing trend is on its infant stage as of now but it can soon be a sought after sport in the country. The most important factor for surfing is a proper swell on the ocean. Swell is basically a collection of waves. The swell direction, that is essential for surfing, is certainly the best along the Indian coastline. The average height of swell in India is 3 to 8 feet across the coastline. The good season for surfing here is from April to September. It may slightly differ according to the places. The swell direction on the West coast is the best for surfing. There are many good places along the coast of Arabian Sea.Starting from the state of Gujarat in the west to down south in Kerala. We bring you some of the known places which are ideal for surfing. In Gujarat, Dwarka is one of the important pilgrimage spot for Hindus. But surprisingly this is also a place where you can surf. The coastal area has some good swell height which is pretty good for the surf. Although the favourable time is mostly in the month of August only. The southern coastal part of this place has some good swell height. Places like Ganpatipule and Paradise beach are some good spots to grab on for surfing in India. Apart from being the Las Vegas of India, a complete party hub, Goa do have some beautiful surf destinations. All the beautiful beaches of Goa like Baga, Candolim etc are some good surfing points. The Surfing Federation of India is situated in this state. Karnataka has some really good waves where you can have an amazing surf fun. The seashores are pretty good to support the swell heights. The Mangalore Jetty is one of the favorite spot in Karnataka. God’s Own Country is another paradise for a great surf journey with some beautiful landscapes and yummilicious food. As a surfer you will never be disappointed from this place. Kovalam beach is one place where many surfers have a good time! When we head towards the Eastern coast, from Western coast of India, we find the most challenging swells on the waters of Paradip coastline. It is probably the perfect site for all the experienced surfers. Mahabalipuram is the ancient historic town of Tamil Nadu. Once a busy seaport, this destination is now considered as the mother of surfing. People from all over visit this place for an amazing surfing experience.November to March can be a good time to visit this place for surfing. The Union territory of India which was once a french colony is a place worth visit with its lovely architecture and beautiful beaches. Pondicherry is another favourite place of the surfers and the right time for this adventure is from June to January when the waves are favourable for surfing. This town located at the sea shore of Odisha is another dig for the passionate surfers. Ramchandi Beach in Puri is also considered the haven for all the surfers. 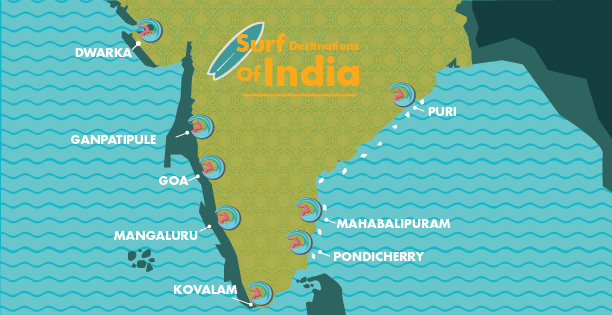 This is the destination where every year the India Surf Festival takes place. People from all across the globe take part in this annual festival. You find a huge amalgamation of people who are in love with this sport. With the advent of the Surfing trend in India, you will find many Surfing enthusiasts who completely owe their heart to surfing. Nowadays, there are many clubs and institutes that are trying to establish themselves and giving their cent percent to make this sport a prominent one in India. Located in Karnataka, this is the First Surf Club of India which was started in 2004. Since then, people from across the globe visit this place for their surf love. They teach surfing over here and have some of the most enthusiastic surfers who also share their knowledge and amazing experience. 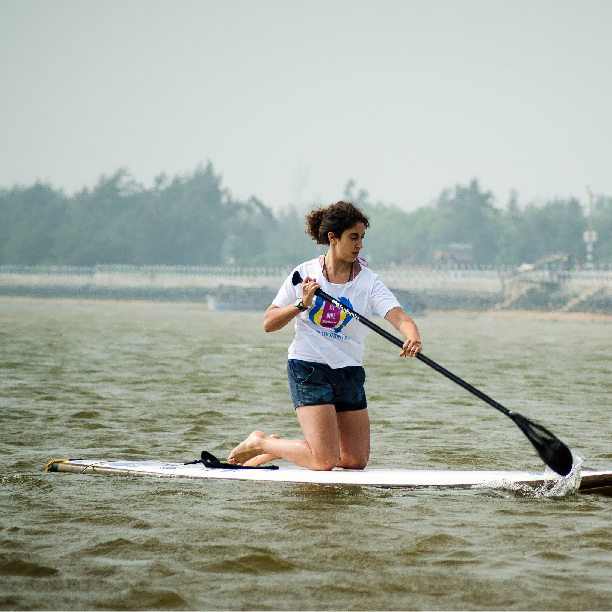 The Shaka Surf club first started in 2007 in a small coastal village of Karnataka, named Kodi Bengre. Headed by some passionate surf lovers this is one place where they teach you how to go with the flow! 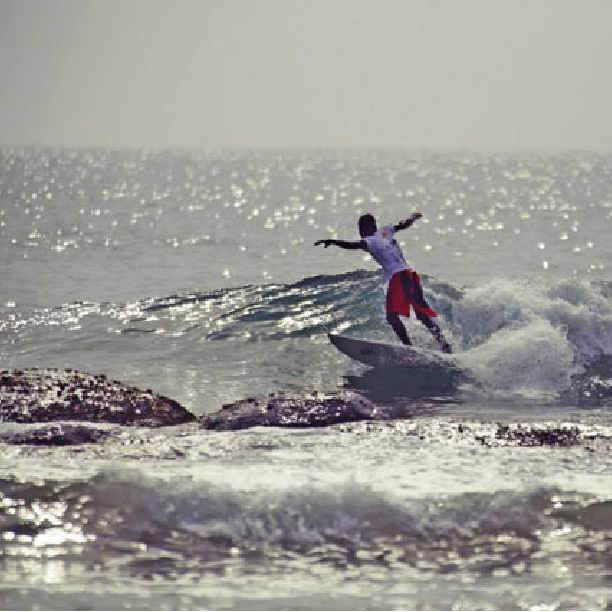 Another place to follow the surf passion in India is Covelong Point surf school in Tamil Nadu. This place is surely a great place to learn a lot about surfing. They even have their own festival every year where many like minded people having a common interest in Surfing visit this place. 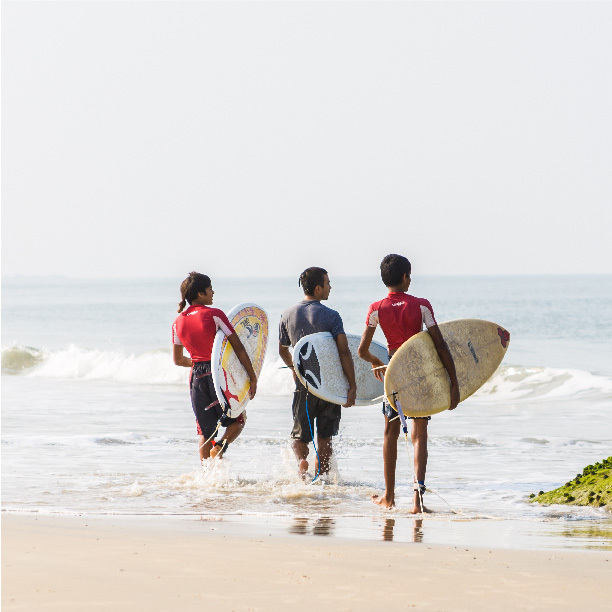 We also have an annual India Surf Festival that takes place at the Ramchandi Beach of Puri in Odisha. This is the place where you will find the amalgamation of the Surf lovers and enthusiasts. The festival is not only about the surf, but there are many other activities like the Music Festival in the evening, photography competition and much more! The festival takes place in February every year but this year it is scheduled to take place in the month of November. We will surely keep everyone aware of this extravagant event whenever the further development takes place. Till then step out with a passion and show some more love to this amazing sport. Just go with the flow and surf your heart out on the waves!! !